HILLSBORO, Ill. - University of Illinois College of Agricultural, Consumer and Environmental Sciences, dean, Kim Kidwell and interim associate dean and director of Illinois Extension, Shelly Nickols-Richardson, visited the Montgomery and Christian County Extension Offices on Friday, April 6. Dean Kidwell is taking field tours all around the state of Illinois to see local Extension in action. Kidwell is on a mission to learn more about University of Illinois Extension and the communities each Extension unit serves. Lunch was hosted at the farm of Brian Knodle and Heather Hampton-Knodle. Rex Brown, CEO of Hillsboro Area Hospital was in attendance and shared opportunities for student projects and research currently going on at the hospital. Dean Kidwell was also able visit the Nokomis Public Library, where she experienced the Starr Shooters 4-H Club’s exhibit, showcasing Japan. Next, Dean Kidwell visited with area high school students and FFA members participating in the Ag Career Day Program at Linda Kiehias’s home in Pana. The dean spoke to the students about U of I and the endless opportunities that come with a degree from the College of ACES. The Dudley Smith Research Farm in Pana was the final stop. Dean Kidwell learned about all of the research that has taken place at the farm and discussed what the future holds for Dudley Smith. University of Illinois Extension provides practical education that helps people, businesses and communities solve problems, develop skills and build a better future. For more information visit the Unit 18 website at http://web.extension.illinois.edu/cjmm or contact your local Extension office. University of Illinois Extension provides equal opportunities in programs and employment. If you need a reasonable accommodation to participate in this program, please contact our office. Universidad de Illinois ofrece igualdad de oportunidades en programas y empleo. Si usted necesita un ajuste razonable para participar en este programa, por favor póngase en contacto con nuestra oficina. 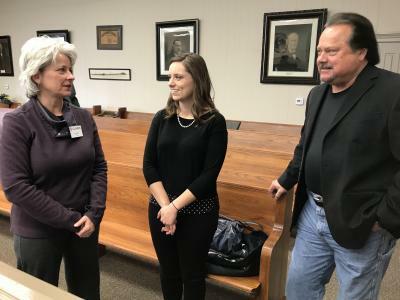 Photo Caption:ACES Dean Kidwell meets with Illinois State Representative Avery Bourne and Litchfield Mayor Steve Doughtery discussing the financial impacts facing Montgomery County.